Clay court season is officially here! 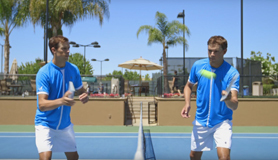 You can Bob and Mike Bryan back in action at the Mutua Madrid Open on May 5. The Bryans have won the Madrid Open six times over their remarkable careers and have reached the finals nine times, including their appearance in 2018. Be sure to atch them on the Tennis Channel and to click on the link below to see an incredible point from the Bros at Indian Wells on ATPTour.com. At the 2nd Annual "Fore Love" Tournament, golf legend Jack Nicklaus and his wife Barbara partnered with Bob and Mike to raise more than $1 million to benefit the Bryan Bros. Foundation and the Jack Nicklaus Children’s Health Care Foundation. Click on the links below to see some of the inspiring work that the Bryans have most recently done on behalf of children.